Whether you’re in the market for an articulated dump truck, skid steer, or excavator, buying used is a smart investment. In fact, the popularity of buying pre-owned has soared as business owners and worksite managers have realized they can get excellent equipment at significant savings, all while avoiding the nearly 40 percent depreciation in value that new equipment has in its first year of ownership. This is a huge advantage for the bottom line, and is especially beneficial when a business is just starting out and needs to build its fleet. The first, and possibly most important, rule of buying used dump trucks is to see the machine in person and take it for a test drive. This is not unlike the process of buying a car. Machines that come with a warranty or guarantee are better than those without, especially when buying from a reputable dealership. Bringing your certified mechanic with you to inspect the used machinery is wise so you can be assured that the machine has a lot of life left in it. A professional mechanic can help you get an idea of possible upcoming costs associated with repairing and replacing parts like tires and seats. As you and your mechanic inspect your desired machinery, check the chassis for damage. Leaking engine fluids, ruptured hoses, broken pumps, non-functional hydraulics, and damage to the metal frame are all indicative of a machine that has likely not been cared for or not regularly serviced. If the machine has a new coat of fresh paint, proceed with caution. That used construction equipment may look shiny and clean, but there could be underlying issues. Depending on the age of the device, the paint job could be covering up a worn machine with rust that has seen heavy use in its short life. Be wary of any welding you find, especially on arms, joints, and attachments. Welding is a means of repair, which could be indicative of past problems that will weaken the frame going forward. When examining the exterior of the equipment, the cab, and most importantly, the engine, beware of strange noises and odors. Some repairs are affordable and will be offset by the overall cost savings of buying used; others, like repairing the drivetrain, can be so costly that you should walk away from the sale. One way to look for drivetrain issues is to inspect the tires for uneven wear which can be an indicator. Tires with cracks or holes will obviously need to be replaced should you purchase the machine, but they could be indicative of used machinery that was left outside or not properly maintained. If your desired equipment runs on tracks rather than tires, inspect the tracks and bolts to ensure they’re in working order. Take a seat. Literally. Hop inside the cab and get a feel for whether the bench is comfortable and in good shape. This is a relatively inexpensive repair as far as used excavators and used dump trucks go, but as your machine operator will be sitting here for 8 hours a day, it’s important that the seat is clean and sturdy. While you’re there make sure the pedals and controls don’t stick or jam, and that the air conditioning and heating works to its fullest capacity. When you’re test driving used dump trucks make sure that you have proper clearance and good visibility, and that the windshield isn’t cracked. Pay special attention to any warning lights that go on, and get a true feel for the way the machine drives in both forward and reverse at varying speeds. Make note of anything that doesn’t sound, smell, or feel right. If your machine comes with any attachments, be sure to try those out as well. You’re paying for them in the total purchase price and you want solid, reliable components that are free from defect. Buying used equipment is a fantastic way to save money, to build your fleet, and to get machines you wouldn’t normally be able to afford at their “new” price. Working with your local, dependable Papé dealership can simplify the process of buying pre-owned and provide you with additional services and benefits, like John Deere’s WorkSight™ technology. 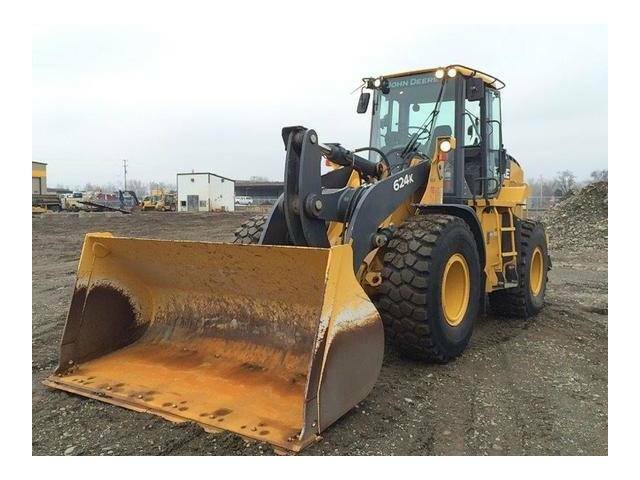 Check out our used construction equipment and machinery at our California, Oregon and Washington locations. Trust us at Papé Machinery Construction & Forestry to keep you moving.